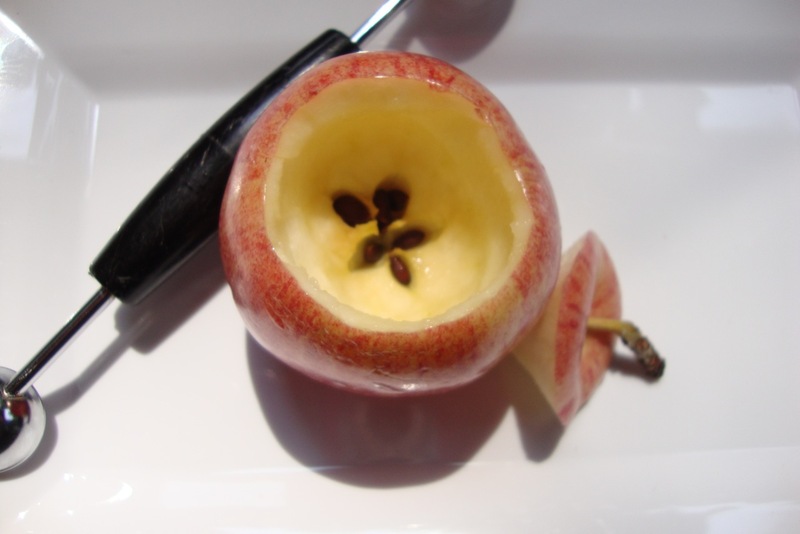 Warning: don’t go Googling to find tips about making a bowl from an apple. You will come upon endless hits—and I do mean hits—for apple bowls whose function it is to maximize every last puff of a certain inhalant that is illegal in most states. I feel so street smart with this discovery, yet at the same time paranoid that my computer has, in the process, acquired hostile cookies and stoner viruses. But my apple bowl is for wholesome apple-y applications. 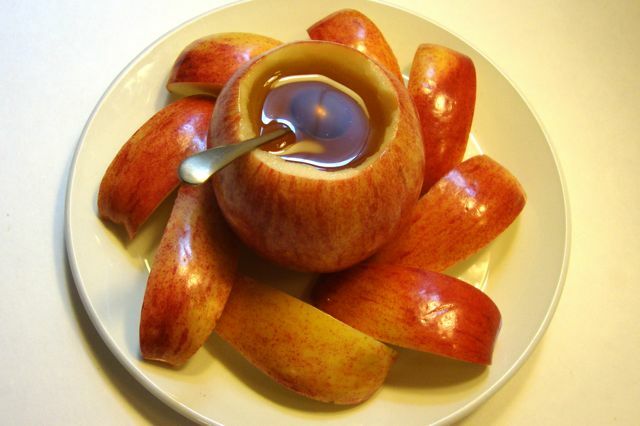 It is an edible craft for Rosh Hashana, fun and easy, legal, and kids will never forget making, using, and eating it. Apples and honey make a sweet start for the Jewish New Year. They take no time to prepare, and even less time to eat: wash, slice, pour, dip, munch. Maybe this is why it’s so easy to take the custom for granted, to treat it like more of an appetizer than a minhag (custom). hands-on reference point to the holiday and a chance to practice kitchen skills, plus the thrill of turning an apple into a dish. They’ll enjoy using the bowl for dipping chunks of round Rosh Hashanah challah, too. A team effort takes a bit longer, but it can make the same old apples and honey way more fun and meaningful. Don’t forget the ּspecial apples and honey blessing. 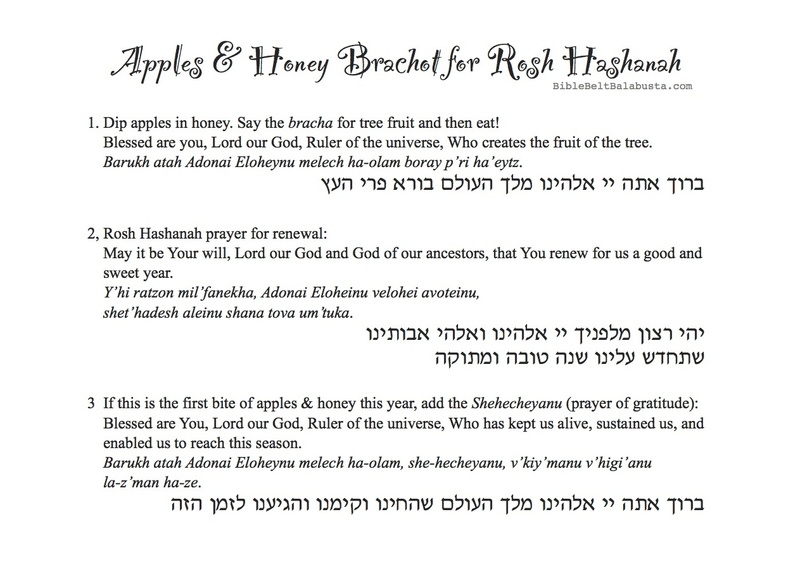 Print the pdf below to keep near the Rosh Hashanah table or glue it to an Apple-Print Blessings Placemat (a paint version or a non-paint version). Blessings— including the one we only use for Rosh Hashanah—turn a sweet treat into a mindful ritual. To go deeper into the seasonal meaning of this custom, you can take kids to pick apples at an orchard and buy local honey. The outing can become an annual tradition (and photo op) your kids will remember. Plus, it supports local agriculture and shows where foods come from. Win-win. Place apple on cutting board (see safety suggestions below). 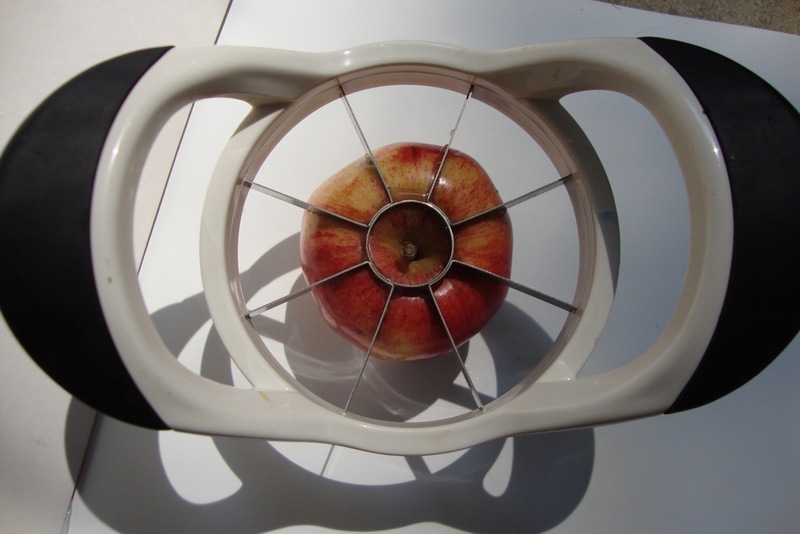 Center apple slicer over the apple with a hand on each handle. Ask your child to put her hands over yours (because you need “help”) and push down together. You may need to rock it a bit from side to side. Push all the way to the bottom and voila: slices for the plate and a core for the compost heap. Once your child has helped operate the slicer, she can try to do it herself. You may need to start the cut by applying just enough pressure to make an indentation. Make sure her hands are on the handles and nothing is underneath the slicer except that apple! To keep cut apples white, your child can either wipe each piece with a lemon wedge or opt for the soak method: cover apple slices in lemon water (a few squeezes should do, but a typical ratio is one part lemon juice to three parts water). By the way, green apples don’t turn brown as quickly as red apples, and some varieties are famously slow to brown (like Cortland and Ginger Gold). If child is helping, make sure the table surface is at a low working height. Standing at a sturdy child-size table is ideal. Close supervision is needed with any cutting tool. Pretend an apple is a pumpkin and gut it in a similar fashion: cut out the top with a paring knife (adult) and scoop the insides with a melon baller (adult or kid). Try not to poke holes in the sides or bottom. Kids can wipe the inside of the finished bowl with a lemon wedge to keep it from turning brown and yucky. Let your child pour honey into the apple bowl and place it in the middle of a serving plate. Drain apple slices and arrange around the bowl. Dip, bless, munch and enjoy. Resources: Apple slicer/corers are found at Target, discount stores and fancier shops like Williams-Sonoma. The Oxo rubber-handled kind is my favorite with kids (very Montessori). 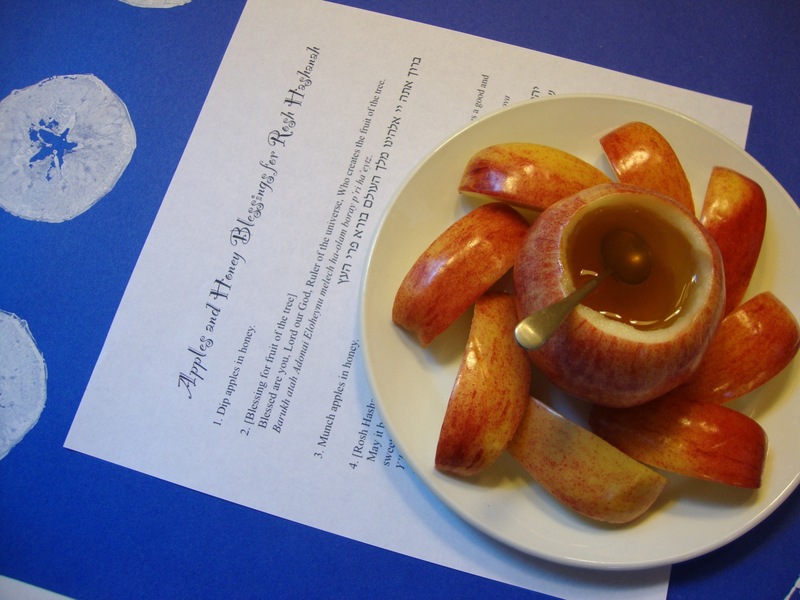 This entry was posted in Activity, Crafts, Edible Craft, Rosh Hashanah / Yom Kippur and tagged Apples, Blessings, brachot, edible craft, Honey, Rosh Hashanah. Bookmark the permalink. This is wonderful! With all of the beautiful Apple and Honey Dishes that we offer there is still nothing like making your own.